Catherine Carr, born 1st September 1881, assumed at Kingston-upon-Thames . After her mother Phoebe's death in 1884, her father Robert James could not cope with nor support his family. The Union Workhouse Kingston did not accommodate children and placed paupers' children to other institutions, mostly to Cowley Oxford but lesser numbers also to Brentwood and Grays in Essex, and Margate and Ramsgate in Kent. The Duff children, Rebecca, Rachel, Esther, William, Catherine and Elizabeth were sent to the Cowley Industrial School, an austere institution run on strict and harsh disciplinary lines on the outskirts of Oxford. The site is now the BMW factory. However, the children benefited from a basic education of the four "R"s - r eading, w r iting, a r ithmetic and r eligion. It is believed that this stood them in good stead when it came to employment. Upon leaving Cowley Industrial School they were found employment in the Kingston area by the "Guardians". 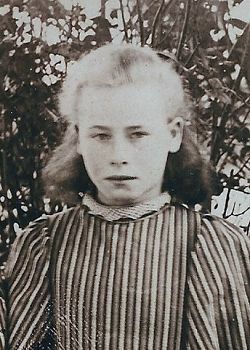 (above) this is an extract of a group photograph of children at the Cowley Industrial School, showing Catherine Carr Duff. The harshness of conditions there is, perhaps, reflected in her face. Catherine Carr was possibly was married in Kingston in 1906 (yet to be confirmed if it is "our" Catherine Duff) but it is definitely known she married a Henry Sykes, whom it is believed she met whilst in service in a big house on Kingston Hill. Catherine, possibly because of her upbringing, was a very private person also very independent. She never spoke of members of the family other than her sisters Phoebe, Esther, Elizabeth. Catherine and Henry had four sons, all of whom were soldiers in WW2. Henry (known as Harry), the eldest, and the youngest John (known as Jack) fought in the Far East . Henry became a prisoner of the Japanese and worked on the infamous Siam Railway. He died 1965. John died in 1962. The two other sons were Herbert and ??? Her middle name is intruiging and is not typical for the family at the time. What follows is purely speculation and maybe clutching at straws. Research in the Neilston area of Renfrewshire (from where Catherine's grandfather James Duff came) has revealed that Kerr is a common surname and a member of the Duff family in the area (not known if related to us) married a Kerr. Given the level of literacy and aural tradition of the era we are wondering if Kerr resurfaced and became translated to Carr. Catherine Carr died in 1960. This page was last updated on15th June 2011.